Alimony & Child Support: Allowed to use for loan qualifying as long as the lender can verify that income has been received for the first 6 months and that income will continue for the next 3 years. Automobile Allowance: Allowed to use for loan qualifying as long as the lender can verify that the borrower is guaranteed to receive this allowance for the duration of the borrower’s employment and has received this allowance for a minimum of 2 years. Bonus & Overtime & Tips: Allowed to use for loan qualifying as long as the lender can verify that this income has been received on a consistent basis for a minimum of 2 years and is likely to continue. Capital Gains: Allowed to use for loan qualifying as long as the lender can verify that this income has been received on a consistent basis for a minimum of 2 years and income disbursement are likely to continue. Disability Allowed: to use for loan qualifying as long as the lender can verify income has been received for 1 month and will continue for a minimum of 3 years. Foreign Income: Allowed to use for loan qualifying as long as the lender can verify that the borrower has a recent 2 year income history via Tax Return filings and verify that income is likely to continue. Foster Income: Allowed to use for loan qualifying as long as the lender can verify that the borrower has had a previous 2 year history of Foster Care experience and income. Full-Time: Allowed to use for loan qualifying as long as the lender can verify that borrower has been employed for a full 2 years, does not have to be at the same job, but does have to be in the same line of work. Interest & Dividend: Allowed to use for loan qualifying as long as the lender can verify that this income has been received on a consistent basis for a minimum of 2 years and income disbursement are likely to continue. Military Income & Housing Allowance: Allowed to use for loan qualifying as long as the lender can verify that this income has been received for a minimum of 2 years. Promissory NOTES: Allowed to use for loan qualifying as long as the lender can verify that income has been received for a minimum of 6 months and that income will continue for the next 3 years. Part-Time: Allowed to use for loan qualifying as long as the lender can verify that income has been received a minimum of 2 years with the same employer. Pensions: Allowed to use for loan qualifying as long as the lender can verify income has been received for 1 month and will continue for a minimum of 3 years. Public Assistance: Allowed to use for loan qualifying as long as the lender can verify income has been received for 1 month and will continue for a minimum of 3 years. Rental Income: Allowed to use for loan qualifying as long as the lender can verify that income has been received for a minimum of 12 months. Income must be shown on most recent year Tax Return filings. Retirement: Allowed to use for loan qualifying as long as the lender can verify income has been received for 1 month and will continue for a minimum of 3 years. Royalty Income: Allowed to use for loan qualifying as long as the lender can verify income has been received for a minimum of 12 months and will continue for a minimum of 3 years. Seasonal Employment: Allowed to use for loan qualifying as long as the lender can verify that income has been received for a minimum of 2 years with the same employer and that employment is likely to continue into the next year. 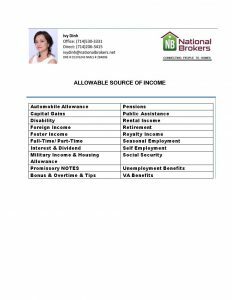 Self Employment: Allowed to use for loan qualifying as long as the lender can verify that income has been received for the most recent 2 years via Tax Return filings. Social Security: Allowed to use for loan qualifying as long as the lender can verify income has been received for 1 month and will continue for a minimum of 3 years. Unemployment Benefits: Allowed to use for loan qualifying as long as the lender can verify income has been received for a minimum of 2 years and is associated with Seasonal Employment. VA Benefits: Allowed to use for loan qualifying as long as the lender can verify income has been received for 1 month and will continue for a minimum of 3 years.